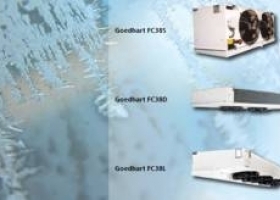 The range Goedhart FC38 standard ceiling mounted air coolers are standard air coolers for cooling and freezing applications (FC38S), working/preparation rooms and storage rooms for humidity sensitive products (FC38D) and for cold storage rooms with height limitation (FC38L). 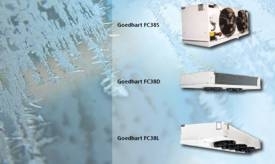 The standard FC38 aircoolers are suitable for all known refrigerants and not corrosive coolants, with the exception of NH3. The fans are suitable for operation in air temperatures between -30°C to +40°C. When the air temperature is lower then -30°C , special fans are needed.